Home News Smartphones Cherry Mobile Razor Specs, Price and Availability Unveiled! 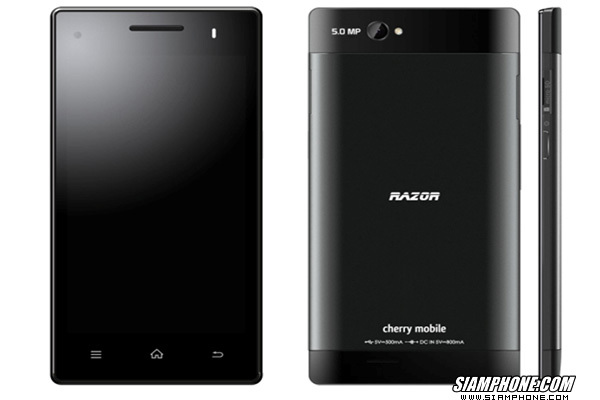 Cherry Mobile Razor Specs, Price and Availability Unveiled! Finally! Cherry Mobile has just unveiled on their Facebook page the official SRP and availability of the new Cherry Mobile Razor. For only Php6,499, the #CMRazor is also dubbed as the "Most Affordable DragonTrail Glass Smartphone" in the market and will be available in stores this July! More about the Cherry Mobile Razor after the jump. At 7.7mm thick, the sleek Cherry Mobile Razor also touts a 4.5-inch qHD (960x540) IPS display that is protected by a layer of Dragontrail Glass panel. The Razor integrates an 8-megapixel main camera coupled with an 2-megapixel shooter in front. Powered by a 1.2GHz quad-core MediaTek MT6589 Processor, the single-SIM (micro-SIM) Razor fluidly runs on Android 4.2 (Jelly Bean) OS. To demonstrate the effectiveness of the Dragontrail glass they even uploaded a video of them trying to scratch or break the Cherry Mobile Razor display with - a Coin, a Pin, a Fork, a Scissors and a Cutter. Check it out below. Availability/ Release Date: #RazorRush starts at July 19 - 21 / Nationwide by July 22! Note: If you already own this phone, please share some of your experiences and opinions about this phone, so that others may be aware of it. Thanks! Sa Thailand po ung pic kasi at ung 5MP CM Razor nila. 8MP nmn po ung CM Razor dito sa atin. sir, bsi po ba ang cam? Baka po, update ko lng po ung post kpag meron po kami nkita. sir rebranded phone ba eto?